Tom Cruise and John Travolta are two of the most well-known members of the Church of Scientology. Following the former’s divorce to Katie Holmes earlier this year, the nature of the quasi-religion/cult, founded by L. Ron Hubbard in 1952, was came under media scrutiny, and not without some bad press. Yet, one key element that was not addressed during the Cruise-Holmes divorce was the type of individual who would join such a movement. The Master gives us some ideas in excellent fashion. Freddie Quell (Joaquin Phoenix) looking like he needs to be seen by the men in white coats. The Master is set during the 1950s, centred round Freddie Quell (Joaquin Phoenix). Freddie is a naval veteran who is yet to find peace with himself after World War II (WWII). He is suffering from a multitude of psychological issues and drinking anything to excess that he can get his hands on. Randomly, he finds himself aboard a ship that is being borrowed by a movement, called The Cause. There, he finds himself mesmerised by Lancaster Dodd (Philip Seymour Hoffman), the charismatic leader of the cult, believing that Lancaster has the cure to his problems. The Master is a 144-minute art-house film with a peculiar atmosphere. The 1950s-style music has been adjusted, weirdly, yet aptly, to make one feel uncomfortable in almost every scene as we explore the nature of this bizarre cult through Freddie’s eyes. One watches with bewilderment as The Cause’s followers lap up Lancaster Dodd’s (bonkers) ideology, as well as their aggressive reactions to those who dare to question any aspect of the dogma, even if it is illogical and contradictory. Moreover, one sees the 1984-style, brainwashing techniques that some cults adopt not only to allow people to join the movement, but to ensure that they are ‘committed’ to the cause. Lancaster Dodd (Philip Seymour Hoffman) giving one of his fantastic, if crazy, speeches about how one is connected to previous and future existences. The alarming craziness of The Cause’s ideology makes up for the slowness of The Master and the lack of activity in the plot. The quality of the acting does the same. Joaquin Phoenix delivers a master-class performance as someone suffering from Post-Traumatic Stress Disorder and alcoholism (paint-thinner and lighter fluid included). He always looks exhausted, distressed, and like he’s about to blow a fuse. Additionally, his speech is consistently slurred, entailing that viewers will believe that Freddie is on the verge of a psychotic breakdown. Whilst Phoenix is the stand-out performer in the film, the rest of the cast do their roles with equal capability, even if their ones are less challenging. Philip Seymour Hoffman plays exceptionally plausibly as the captivating, yet mad and flawed leader of the cult. Hoffman’s aura and charisma, as Lancaster Dodd, indicates why so many people in 1950s America were drawn to (the self-declared human-deity) L. Ron Hubbard. In addition, Dodd’s magnetic personality hints at how Hubbard managed to found the Church of Scientology and accrue millions of dollars from his followers. That all of this can be encompassed in one performance is testament to Hoffman’s acting skills. Phoenix and Hoffman dominate The Master, thereby leaving little room for the rest of the cast to showcase their abilities. Nevertheless, Amy Adams plays very well as Lancaster’s wife, whose devotion to the movement is scarily absolute; similar things can be said for Ambyr Childers, who plays as Lancaster’s daughter, and who spends much of the time she is on screen teasing Freddie; and Jesse Plemons does a decent enough job as Lancaster’s son, who ultimately knows that his father is a phoney making it all up as he goes along. Peggy Dodd (Amy Adams), Lancaster’s wife, appeaing to her husband to do something about Freddie due to his drinking problems. Much praise should rightly go to the cast. But director Paul Thomas Anderson should also get credit for making The Master look like one is reliving 1950s America. The clothes, the hair-styles and the music all seem to perfectly fit into place. Furthermore, there is no mention of the term ‘Post-Traumatic Stress Disorder’ in the movie. This is because the term did not exist in those days. Still, it would have been easy for Anderson (even if it would have been patronising on the audience) to have had someone in the film state the obvious and make a factual error. After-all, in Gladiator Ridley Scott made Lucilla, the sister of Emperor Commodus, played coincidentally by Phoenix, outlive her brother when in fact she predeceased her brother; and in the 2009 Dorian Gray, Oliver Parker inserted the Suffragettes into the narrative, even though when Oscar Wilde wrote the book in 1890 the Suffragettes had yet to be formed. Anderson, therefore, should be complimented for not falling into such a trap. All-in-all, The Master is a brilliant, but strange movie. The film might be slow, long and devoid of a linear plot. However, with superb acting and analogies to real-life cults, like Scientology, one is likely to be mesmerised whilst watching the movie from the point of view of the messed-up Freddie. Freddie might have ostensibly little in common with the likes of Tom Cruise and John Travolta but, through Freddie, The Master can give one an understanding for the sorts of people who join cults. During the campaign to become the President of America, the public and the media tend to focus so greatly on the candidates and their running-mates that the people behind the campaigns frequently fade into the background. The Ides of March, in fascinating fashion, reveals some of the darker arts that go on behind the scenes in presidential races, and why a term synonymous with the assassination date of Julius Caesar is so apt. The main men behind Morris’ campaign, Paul (Philip Seymour Hoffman), Ben (Max Minghella) and Steven (Ryan Gosling), sitting and discussing the campaign with the journalist, Ida (Marisa Tomei). The Ides of March is not a true story. But much of the film, directed by George Clooney (Confessions of a Dangerous Mind, Good Night, And Good Luck, Leatherheads), is based round the unsuccessful run of Clooney’s father, Nick Clooney, for Congress in 2004. The movie centres round Steven (Ryan Gosling – Fracture, Drive, The Big Short), a relatively young and idealistic Junior Campaigns Manager for the Governor of Pennsylvania, Mike Morris (George Clooney – Michael Clayton, The American, Gravity). Morris is in the running for the Democrat presidential nomination, and is up against Senator Ted Pullman (Michael Mantell – A.I. Artificial Intelligence, Ocean’s Thirteen, Ca$h). To gain the necessary number of Democrat delegates for nomination, Steven and his boss, Paul (Philip Seymour Hoffman – Capote, Mission Impossible III, The Master), attempt to court Senator Thompson (Jeffrey Wright – Casino Royale, Source Code, Extremely Loud and Incredibly Close), who holds the delegates for Ohio, a key state for nomination. However, Tom Duffy (Paul Giamatti – Saving Private Ryan, Cinderella Man, 12 Years A Slave), Pullman’s Campaign Manager, has secretly made an agreement with Thompson, offering the Senator the position of Secretary of State in exchange for his endorsement. For Steven and Paul, the agreement must be broken at any cost. Simultaneously, Duffy pulls a trick or two of his own, with Steven in the thick of it. Thus, the campaign backstabbing begins. 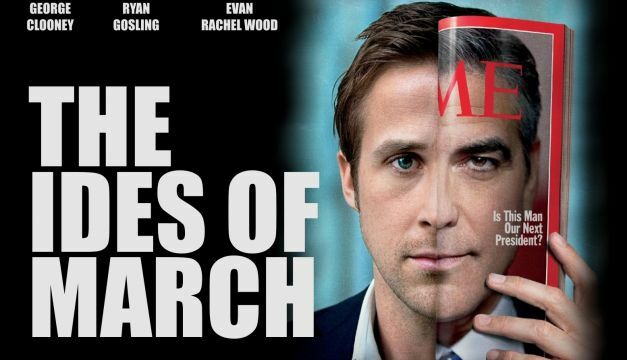 The plot for The Ides of March is not particularly fast-moving, but it is interesting and revelatory. Certain aspects of the storyline might go too far (as some of the scandals would be almost impossible to keep hushed up with the current hawk-like media), but over-all it is plausible. Indeed, it is believable that some campaigners would betray their loyalties for personal gain, hence the film’s title being so fitting. The pretty intern, Molly (Evan Rachel-Wood), out for a drink with Steven. Paul and Duffy, the characters played by Philip Seymour Hoffman and Paul Giamatti, respectively, epitomise the modern day Marcus Brutus, the friend-turned-assassin of Caesar. Both, Hoffman and Giamatti, play the ruthless sort of individuals who would use underhand tactics to ensure that their candidate would come to the fore. 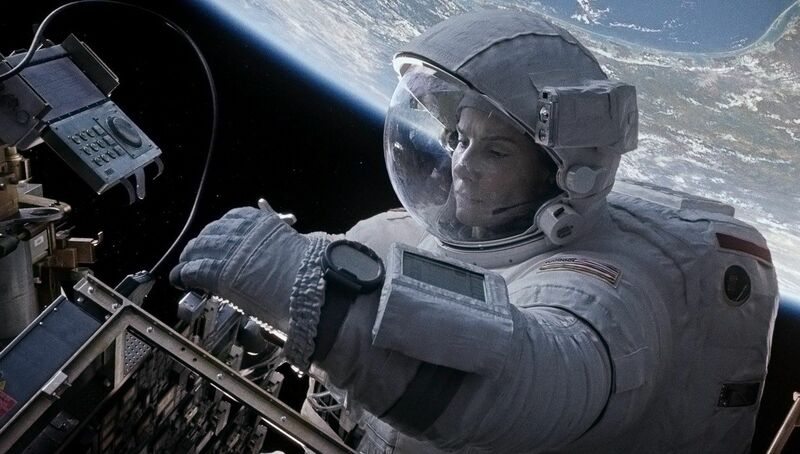 Without being outstanding, both actors play very well. Moreover, their characters teach Steven a lesson in the malicious nature of political campaigns and politics in general too. If one leaves the cinema with a bad taste in their mouths about politics, this might reflect the director’s disillusionment with the industry after his father’s failed campaign. Could Steven’s experiences in The Ides of March divulge some of what happened to Nick Clooney in 2004? Regardless, Steven’s actor, Ryan Gosling, gives a solid performance in the lead role. The changes he goes through, as events around him get nasty, are praiseworthy. It also gives Steven’s personality a third, survival-type dimension that makes his character credible. Yet, Gosling is far from brilliant; he lets himself down when Steven’s with Molly (Evan Rachel-Wood – Thirteen, The Wrester, True Blood), the cute, just-out-of-college intern. Their conversations are, at times, painful to watch, and their exclusion would have benefitted the film. 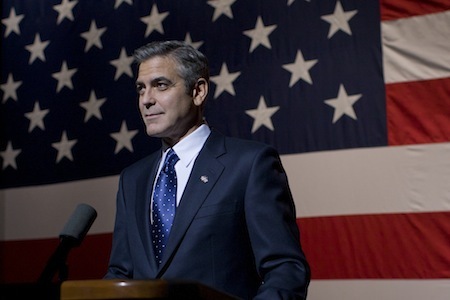 Surprisingly, George Clooney has only a limited role in The Ides of March. As ever, Clooney’s character, Mike Morris, is smooth-talking and suave (smug as well). But how many times has Clooney churned out this sort of performance? In saying that, Governor Morris also has a shady side, which gives him depth and virtually certifies him as a real (morally dubious) politician. 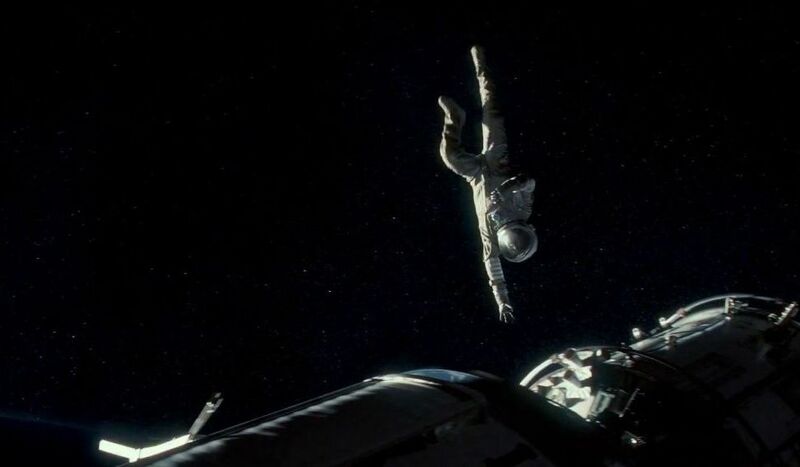 Still though, Clooney’s performance here is one we expect from him, and is, therefore, nothing exceptional. Governor Mike Morris (George Clooney), looking very presidential, addressing an audience as part of his campaign to become the leader of the free world. 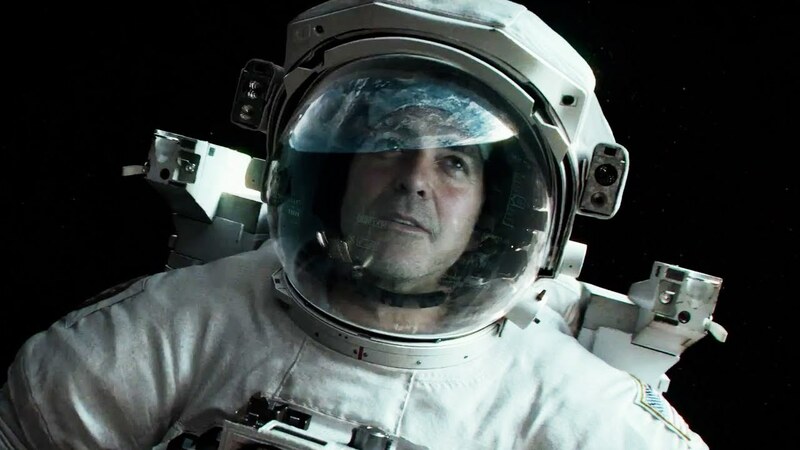 Clooney’s ability to act, direct, produce, and screen-write vary in quality. The directing and the production are fine, even if there is an unexpected amount of silence before and during scenes. The way the movie has been choreographed might seem peculiar as well, since discussions frequently begin a while before the people come together in the scene. That does not make it bad, just unusual. The same is true for the music, which Clooney probably did not use enough to his advantage to enhance scenes or uplift viewers, unlike The King’s Speech. Nevertheless, Clooney has written the dialogue very well. It may not be on a par with The Social Network, The King’s Speech or True Grit; yet, it is always apt for the scenarios without being melodramatic. On the whole, The Ides of March is a very decent film about an indecent industry. The world of presidential campaigns is one that often goes unreported, and this movie sheds light (or darkness) upon it. Above-all, just like its title, The Ides of March exposes the ruthless, double-crossing nature of politics and political campaigns, and why it is perhaps not an industry for nice, honest people.